In this country, it’s no surprise California is the most polluted. What is surprising is that San Joaquin Valley nearly tops the list of most polluted places in the United States according to the Los Angelos Times. From Bakersfield, to Fresno and Modesto, cities not very far from Stockton have some of the lowest air quality. This is a matter that is often taken lightly by Americans. The problem cannot be cured, but on April 21, each year the goal is to help people understand the harm they cause to the earth during their day-to-day routines. This day, is Earth Day. Earth Day exists to inform people how to become active members in preserving the environment and it serves to encourage people how a few small changes in their lifestyles has the potential to make a huge impact on the environment, including do-it-yourself tips. Reusable versus waste. Car pooling versus driving alone. Biodegradable material versus harmful and unsafe ingredients. These eco-friendly terms were used all day throughout campus during its annual Earth Day celebration. 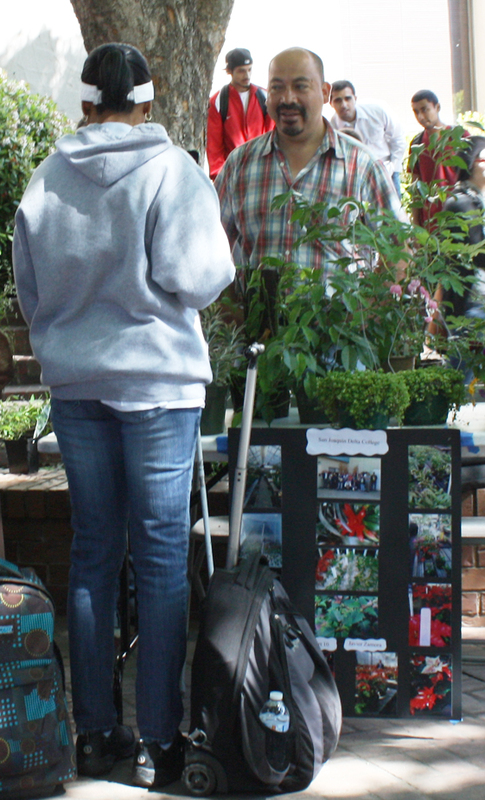 A variety of vendors bombarded the quad with helpful tips on the effective way to be more earth friendly in everyone’s own home. “[We’re here] to make people aware that they can contribute to save land space. At the same time we’re saving the earth. It’s a win-win situation,” said Kim Sawyer, a representative for the city of Stockton. Campus organizations like the Fashion Program joined this green event in full swing. Fashion students were challenged to create a biodegradable outfit. The students completed this task by stitching together tough material like newspaper, plastic bags and one even made with broken cd’s. Fashion student Tien Nguyen contributed. “The dress I made was from rice bags. Instead of throwing them away, I just turned it into a dress,” she said. This event was a resourceful experience for everyone. Collectively, there was something in the quad to represent every aspect of going green. There were representatives teaching people how to cut out the middle man and make their own compost, unclog our air by carpooling, riding a bike as transportation, or using hybrid vehicles. Automotive student Shawn Powers has had the opportunity to work with the newer technology on hybrid cars, including the kind that plug in. “It’s definitely more eco-friendly. But it’s not that useful for me because I live an hour away and it has to be charged every 40 miles,” said Powers. Some techniques can be more Earth-friendly but may seem harder to understand than others. Delta’s Earth Day is a stepping stone for people to learn that anyone is capable to do something small to make a big difference in the ecosystem.